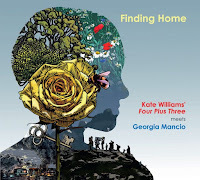 Kate Williams (piano); Georgia Mancio (voice); John Garner, Maria Schreer (violins); Francis Gallagher (viola); Sergio Serra (cello); Oli Hayhurst (bass)); David Ingarmells (drums) + John Williams (guitar on 2 tracks). A cracking album - I've come to expect nothing less from Georgia. A lunchtime gig at Cadogan Hall some years back planted the seed which bore fruit when I heard her on disc, and later live with Alan Broadbent at GIJF. Since then I've checked her out and regretted I haven't been able to get down to Pizza Express for her justly acclaimed ReVoice sessions. Finding Home fills that gap. The voice is as smooth as silk. 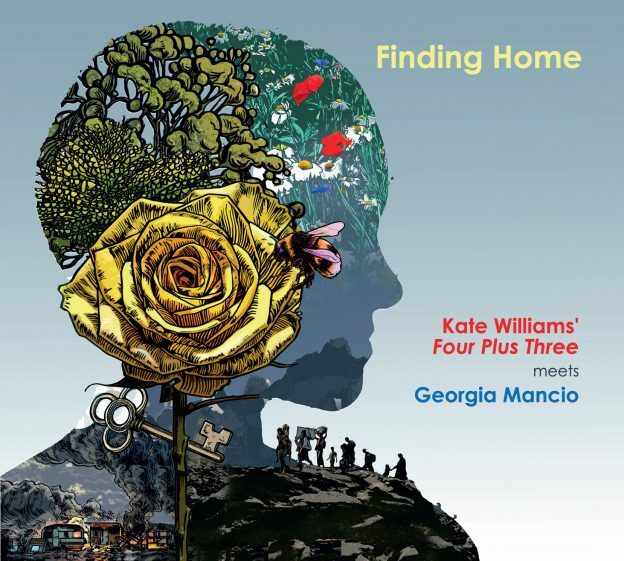 Kate Williams' Four Plus Three - a successful merger of piano trio and string quartet - provide the perfect accompaniment to the mix of standards and originals. On the originals, with the exception of Alan Broadbent's Tell the River, Kate Williams composed the music and Georgia the lyrics. From the title track - I find a way forward and now I know my way back. Clever words that typify the various stories the singer conveys with her lyrics. The subjects are varied. Two of the subjects - the refugee crisis and our place in the natural world - are so far removed from what we expect to hear and yet they hit the spot. Perhaps they even make the listener realise that there are more important things to be concerned about than the price of a pint or whether your team will be relegated - maybe even more important than the B word. Kate's father, the world-renowned classical guitarist John Williams is featured on 2 tracks whilst the string quartet includes John Garner on violin who is not unknown in the northeast. Although the album isn't officially released until June 1, it can be obtained from from https://www.georgiamancio.com/ Georgia and Kate take the band on the road with gigs in April, May, June and July. Sadly, Bolton Abbey, Skipton, seems to be the most 'northerly' point. An all too familiar story. It would be interesting to know why an Arts Council England/Lottery funded project isn't being taken up by our local promoters. Is it the bands who are reluctant to travel north or the promoters who feel the music is too way out or maybe not way out enough? An album that I found to be delightful in a thought-provoking way.